Like food, wine is perishable and needs to be stored or “cellared” correctly in order to maintain its structure. Many wines do improve with age, and the ability of a wine to age is influenced by many factors including grape variety, vintage,viticultural practices, wine region and winemaking style. The condition that the wine is kept in after bottling can also influence how well a wine ages and may require significant time and financial investment. Storage is an important consideration for any wine that is being kept for long-term aging. While most wine produced today is meant for near-term consumption (with much being consumed within 24 hours of purchase), there are certain situations in which it may be set aside for long-term storage. Wine is one of the few commodities that can improve with age but it can also rapidly deteriorate if kept in inadequate conditions. The three factors that have the most direct impact on a wine's condition are light, humidity and temperature. Direct light, whether it be sunlight or incandescent, can adversely react with phenolic compounds in the wine and create potential wine faults. Delicate, light-bodied white wines run the greatest risk from light exposure and are often packaged in darkly tinted wine bottles that offer some protection from the light. Wines packaged in clear, light green and blue colored bottles are the most vulnerable to light and may need extra precautions for storage. Some degree of humidity is required in order to keep wines with cork enclosures from drying out. Even when wine bottles are stored on their sides, one side of the cork is still exposed to air. If the cork begins to dry out, it can allow oxygen to enter the bottle, filling the ullage space and possibly causing the wine to spoil or oxidize. Excessive humidity can also pose the risk of damaging wine labels, which may hinder identification or hurt potential resale value. Wine experts such as Jancis Robinson note that 75% humidity is often cited as ideal but there is very little significant research to definitively establish an optimal range. Some experts even feel that refrigerators are too drying for the corks, and refuse to store wines in them. Wine is very susceptible to changes in temperature, with temperature control being an important consideration in wine storage. If the wine is exposed to too high a temperature (in excess of 77 °F (25 °C)) for long periods of time, it may become spoilt or "cooked" and develop off flavors that taste raisiny or stewed. Dramatic temperature swings (such as repeated transferring a wine from a warm room to a cool refrigerator) can also cause adverse chemical reactions in the wine that may lead to a variety of wine faults. Most experts, such as Jancis Robinson, recommend that wine be kept at constant temperatures between 50-59°F. Tom Stevenson speculates that 52°F may be the most ideal temperature for storage and aging. Most wine racks are designed to allow a wine to be stored on its side. The thinking behind this orientation is that the cork is more likely to stay moist and not dry out if it is kept in constant contact with the wine. Some wineries package their wines upside down in the box for much the same reason. Research in the late 1990s suggested that the ideal orientation for wine bottles is at a slight angle, rather than completely horizontal. This allows the cork to maintain partial contact with the wine in order to stay damp but also keeps the air bubble formed by a wine's ullage at the top rather than in the middle of the bottle if the wine is lying on its side. With the rise in the popularity of wine, many homeowners are having personal cellars or wine rooms stored in their homes. A wine cellar is a storage room for wine in bottles or barrels. In an active wine cellar, important factors such as temperature and humidity are maintained by a climate control system. In contrast, passive wine cellars are not climate-controlled, and are usually built underground to reduce temperature swings. An aboveground wine cellar is often called a wine room, while a small wine cellar (less than 500 bottles) is sometimes termed a wine closet. Not all wines are at their peak at the time of purchase, not all wines age with time and those that do age can take longer than others. Wines packaged in large format bottles, such as magnums and 3 liters, seem to age more slowly than wines packaged in regular 750 ml bottles or half bottles. This may be because of the greater proportion of oxygen exposed to the wine during the bottle process. After aging at the winery most wood-aged Ports, Sherries, Vins doux naturels, Vins de liqueur, basic level Ice wines and sparkling wines are bottled when the producer feels that they are ready to be consumed. These wines are ready to drink upon release and will not benefit much from aging. Reds tend to age the best, but the variety will dictate on how long until it reaches maturity. It is a possible for a wine to age too long, it will start to descend into decrepitude where the fruit tastes hollow and weak while the wine's acidity becomes dominant. The best way to find out if your wine is ready to drink is to visit the winemaker’s Web site or ask the experts at your local wine shop or wine bar. Many wine collectors today entrust their cellar to a professional off-site wine storage facility. A wine facility is a secure self storage and concierge wine cellar storage solution. They provide state of the art wine storage lockers to store your wine and many alos have a comfortable well-appointed lounge for your wine tasting pleasure and relaxation. Wine Vault - Mamaroneck, NY – The Wine Vault offers wine cellar storage for your wine collection at an unsurpassed price in an unsurpassed secure environment. The Wine Vault is a Private Storage Facility, limited to a maximum of 175 locker members. We have built a state of the art storage vault with individual mahogany lockers to store your wine. 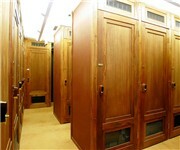 There is no fee to be a member and we do not sell anything, we simply rent private locker space. Vintage Wine Warehouse - New York, NY – Wine Storage in New York at Vintage Wine Warehouse - New York's largest and oldest wine storage facility offering the most competitive full service wine storage, handling and delivery rates in the metro area. Experience our signature personal, professional and courteous service for as low as $1.60 PER CASE per month. Kent Certified Wine Cellar - Chicago, IL – Kent Cellars is the only above ground Chicago wine storage facility, therefore you’re assured that you’re wine will never be flooded. We are the Midwest's first wine storage company, serving personal and commercial customers since 1982. Eastside Wine Storage - Bellevue, WA – "Our mission is to make the management and storage of your wine collection more convenient and enjoyable. We provide world-class wine cellaring services to the Eastside and greater Seattle community." Standard locker sizes range from 9 to 84 cases. Shelving is available for easy access to all of your wine. For the avid collector, our walk-in lockers provide ample storage capacity or allow you to build your own racking system. Cellar 55 - Vancouver, WA – Cellar 55 is one of the premier wine storage facilities in the Pacific Northwest. Our 9000 square-foot facility is located minutes from I-5 in downtown, historic Vancouver, Washington. Our state of the art facility accommodates wine collections ranging in size from 9 to 350 cases. Seattle Wine Storage - Seattle, WA – Seattle Wine Storage, Inc. has been dedicated to providing ideal conditions for storing your valuable wine collection since 1995. Storing your wine is our only focus. Seattle Wine Storage is located close to downtown and just minutes from all major freeways. With our recent expansion, Seattle Wine Storage has an 1,100 sq. ft. lounge area for client use. You can relax with friends over a glass of wine. Wine Storage of Denver - Denver, CO – Ideal wine conditions are difficult to establish in a home or loft. Stashing your fine wine in a basement or crawl space is a risky venture. Storing your wine in the Wine Storage of Denver facilities is an affordable alternative to building your own temperature-controlled wine cellar and will allow your wines to mature to their full potential. We are offering a reliable and hassle-free way to store and age your wine properly. Portland Wine Storage - Portland, OR – Wine storage at this downtown Portland, Oregon facility is state-of the-art, convenient, and secure. Only a stone's throw from the Willamette Valley, Portland Wine Storage provides 55 degree, 70% humidity climate control in a cave-like atmosphere. Our private cellar rooms and personal wine storage lockers are ideal for individual bottle racking as well as case storage for any size collection.